On December 27, 2016, the British CFA Society (an organisation representing Chartered Financial Analysts) released an interesting report that they had commissioned from academic researchers at the Lancaster University Management School. The Report – An Analysis of CEO Pay Arrangements and Value Creation for FTSE-350 Companies – explodes another mainstream economics myth that pay is in accordance with contribution to production adjusted for so-called compensating differentials (danger, risk etc). The Report confirms many other research publications over the years that there is little or no relationship between the pay that the top CEOs receive and the performance of the companies they manage. In fact, executive pay seems to grow even when their companies go backwards and their workers are shown the door (lose their jobs). It is just another one of those scams that we have been lulled into accepted in this neo-liberal era. It is one of the scams that a progressive agenda has to attack and develop policies to reverse. There should be legal frameworks in place as part of company law to force boards to scale pay to performance as a first step. The results of the research also allow us to see through some of the central arguments in favour of privatisation – viz, that public enterprises are wasteful because there are no shareholders to discipline the management. Well, the research discussed below shows that shareholders have very little sway on management and the boards that hand out massive and unjustifiable executive salaries. … the link between executive compensation and corporate performance. In 2012, the Kay Review of UK Equity Markets and Long-term Decision Making – produced by economist John Kay investigated the “long-term performance and governance of UK quoted companies” in terms of equity market performance. … to ask how well equity markets are achieving their core purposes: to enhance the performance of UK companies and to enable savers to benefit from the activity of these businesses through returns to direct and indirect ownership of shares in UK companies. … short-termism is a problem in UK equity markets, and that the principal causes are the decline of trust and the misalignment of incentives throughout the equity investment chain. How many restructures has your organisation been through? My university has been through several in the last 20 years, each time, productivity and worker morale has plummetted, and at the end of it I cannot believe the core business (teaching and research) is being done better as a result. Kay found that short-termism leads management to make “bad long-term decisions” and it is clear that in the UK (at least) “that equity markets have evolved in ways that contribute to these errors of managerial judgment”. So sharemarkets do not act as a discipline in the way the mainstream narrative flows. This is very important in relation to the ideological defense of privatisation. One of the principal arguments used is that publicly-owned enterprises fall into lethargy and waste because there is no scrutiny from shareholders on what management does. So by privatising the activity, this scrutiny forces management to reduce costs and increase per unit output (productivity) and we all benefit. Well a substantial body of research has found that assertion to be way off the mark. The Kay Report clearly found that equity markets do not behave in the way that the ‘efficient market hypothesis’ would have us believe. Bad policy and bad decisions often have their origins in bad ideas. We question the exaggerated faith which market commentators place in the efficient market hypothesis, arguing that the theory represents a poor basis for either regulation or investment. Regulatory philosophy influenced by the efficient market hypothesis has placed undue reliance on information disclosure as a response to divergences in knowledge and incentives across the equity investment chain. This approach has led to the provision of large quantities of data, much of which is of little value to users. Such copious data provision may drive damaging short-term decisions by investors, aggravated by well-documented cognitive biases such as excessive optimism, loss aversion and anchoring. A pretty categorical dismissal of the claim that shareholders exercise a lot of clout in the day-to-day running of the companies they own. They are secondary to the so-called “asset managers”, which set their own agenda that is, typically, in conflict with the needs of the company owners and the society as a whole. This conflict between the imperatives of the business model of asset managers, and the interests of UK business and those who invest in it, is at the heart of our analysis of the problem of short-termism. It was these findings that motivated the CFS Society to commission the Lancaster University Management School research. Remember that the mainstream economics textbook narrative claims that income distribution in capitalism is fair because all income recipients receive rewards commensurate to their contribution to production. This is so-called Marginal Productivity Theory that students are forced to rote learn as part of their indoctrination. It emerged in the literature in the second half of the C19th as a deliberate ploy to combat the growing interest in Marxism among workers. It was designed to counter the obvious Marxian observation that workers are exploited under Capitalism and owners of capital receive incomes yet do nothing productive. They are able to receive this ‘ownership’ reward because they underpay the workers (wages are less than the output that workers produce) – that is, they expropriate surplus production (value). That is intrinsically unfair and the revolts that were seen in the middle of the C19th threatened the capitalist hegemony. Marginal Productivity Theory was designed to assuage that sentiment and make it look as though all incomes were the reward for productivity. One gets back what they put in – how much fairer can that be? They allow for some differentials where there are compensating elements – so the claim is that a bad, dangerous job will be paid more than a safe, clean job. The problem is that it is is a fairy tale. Neither theoretical assertion stacks up in the real world. 1. There is very little relationship at the top end of the income distribution between pay and productivity. 2. The worst and risky jobs tend to also be low-paid while the cushy safe jobs tend to be well-paid. The UK research certainly explodes the idea that CEO wages reflect their contribution. 1. What performance metrics do FTSE-350 companies use as the basis for determining CEO pay? 2. How do commonly used performance metrics such as EPS and TSR correlate with established measures of long-term value creation to all capital providers? 3. What is the strength of the association between realized CEO pay and company performance, where performance is measured using both traditional metrics and established measures of long-term value creation? To advance these issues, they examined the relationship between total CEO pay (“salary, short-term bonus payments, deferred bonuses, long-term remuneration, pensions, and benefits in kind”) and various performance measures (sales growth, return on assets, profit, residual income, economic value added, etc). Their sample period covered 2013 to 2014/15. The interesting finding is that it is the performance component of the CEOs’ packagages that drove the 82 per cent pay rise despite any robust evidence of anything more than minimal actual performance improvements – virtually negligible. Salaries accounted for only 28 per cent of the realised pay for the average CEO. Bonuses – 27 per cent, Pension and Benefits-in-kind 8 per cent and so-called long-term remuneration 38 per cent. Whatever spin one might try to put on this the inexorable conclusion is that sharemarkets do not ensure that management pay bears any relations to productivity and value to the firm. The situation is only marginally better in Australia. The Australian Council of Superannuation Investors publishes and annual CEO pay survey. The most recent was published on August 31, 2016 – CEO Pay in ASX200 Companies: 2015 – and covers executive pay for the 200 listed companies on the Australian Stock Exchange. The survey (and additional earnings data from the ABS) shows that in 2001 (when the first survey was taken) the ratio of average CEO pay to total earnings by workers was 76 to 1. By 2015 this ratio was 84 to 1, although it peaked at 123 to 1 in 2007 just before the crisis. I have already discussed on several occasions the widening gap between productivity growth and real wages growth, which manifests as an increasing profit share in national income and a decreasing wage share. This redistribution of national income towards capital has been ongoing for the last three decades or so in most countries and is a characteristic of the neo-liberal era. Where does the real income that the workers lose by being unable to gain real wages growth in line with productivity growth go? Answer: Not in private capital formation, which has not grown in proportion to the largesse that has been distributed away from workers to capital. Some of the redistributed income has been retained by firms and invested in financial markets fuelling the speculative bubbles around the world. Some of has gone into paying these massive and obscene executive salaries that we are discussing in this blog. One of the essential changes that needs to happen to ensure that another bout of financial instability doesn’t hit soon is that real wages have to grow in proportion with productivity growth – exactly the reverse of what is happening now. Overall, the dynamic that, in part, created the GFC – suppression of real wage rises in line with productivity growth and the resulting reliance on private debt to maintain consumption spending, is back and the world is building up again for GFC Mark 2. That will require a fundamental revision of the way executive pay is determined and significantly reduced payout outcomes for the bosses. In FY15, average realised pay was again significantly higher – 11% – than average reported pay. Median realised pay of $3.88m was however 4.6% lower than median reported pay of $4.07m. This again illustrates a feature of realised pay observed in prior studies: that a small number of executives receive realised pay significantly higher than their reported pay (calculated in accordance with accounting standards), especially in cases where security prices rise rapidly. See also the accompanying press release (August 31, 2016) – CEO fixed pay down, but bonuses the ‘new normal’. The Report found that while boards were cutting the fixed pay of new CEOs (as positions turnover), the binge has moved into “strikingly persistent bonuses”, which when you look at the performance of the top 100 companies do not seem to be proportional. Such a high proportion of CEOs receiving 76% of their bonuses really raises questions about the appropriateness of bonus hurdles … This begs the question – are bonuses really just fixed pay dressed up as at-risk pay? Through and elaborate series of mechanisms involving “exercising options and performance rights, along with the vesting of shares under long term incentive schemes”, the top 10 CEOs earned $171.4 million while they reported for statutory purposes earning $99.63 million in 2014. In 2015, realised pay for the top 10 was $161.3 million while the reported pay was $98.7 million. 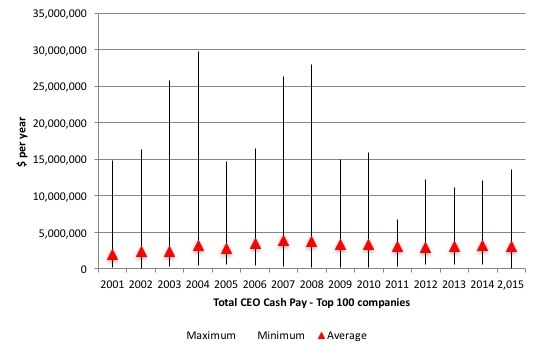 The next graph shows the average total CEO Cash Pay in the Top 100 companies (red triangles) and the maximum and minimum values for each year. The ACSI define the total cash pay as “fixed pay, cash bonuses and accrual of entitlements”, so more or less what an average worker might receive each year (the bonuses if they are lucky). There is considerable disparity within the ranks of the CEOs (from max to min). There are some sensationally large salaries and some rather modest ones (in relative terms). 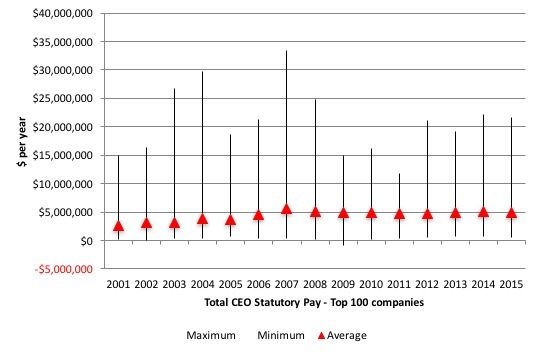 The next graph shows the average total CEO Statutory Pay in the Top 100 companies (red triangles) and the maximum and minimum values for each year (see accompanying table for actual dollar values). The ACSI define statutory pay as “the total remuneration disclosed for a CEO in a company’s remuneration report, as required by Australian law. It therefore includes the value of share-based payments expensed under accounting standards”. Don’t be fooled by the different scale of the axes in each graph – the statutory pay is a huge step up on the total cash pay although clearly well below the ultimate realised earnings (as detailed in the first graph). 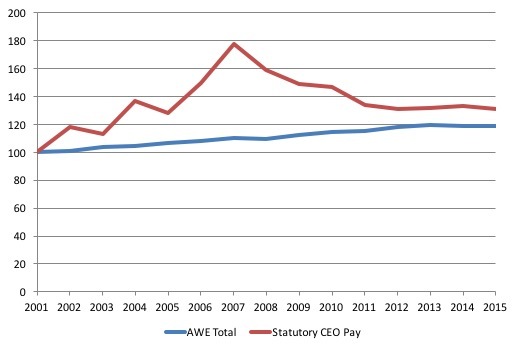 The next graph shows the Ratio of CEO Statutory Pay to Total Average Weekly Earnings (blue line) and Total Average Weekly Full-time Earnings (red line) from 2001 to 2015. The ratio for the former started at 76.2 in 2001, peaked at 123.1 in 2007 at the height of the ‘greed is good’ frenzy and is now back to 83.9 and has steadied. The ratio for the latter started at 58.6 in 2001, peaked at 93.7 in 2007 and is now back to 61.7 and has steadied. These differentials are always justified by the conservatives and the business lobby as being essential to attract top quality executives. But then we know that company performance is not closely linked at times to the pay that the CEOs get, which puts a hole in that argument. The boom that lit the fuse of the global crisis then overwhelmed commonsense and decency … Pay was out of control at that time in almost every way. Short-term bonus hurdles were too low, shares were vesting too quickly and on terms that were too generous, and termination payments were too big. Company leaders offered various excuses, all of them lame. This is the ‘greed is good’ frenzy that was associated with the total failure of the financial market and associated labour markets to self-regulate along the lines that the mainstream economics and finance textbooks claimed. The following graph shows the movement in real Average Weekly Earnings (blue line) and Statutory CEO pay (red line) both indexed to 100 in 2001. The data is also deflated using the Consumer Price Index, so reflects real growth. I also use Average Weekly Total Earnings (which provides some measure of the shift towards part-time work) and a better indicator of the central tendency in the labour market. You can see that the CEO Statutory pay has grown over the period in real terms by 30.9 per cent whereas the average worker enjoyed only a 18.9 per cent increase over the 13-year period. Of course, the CEO real pay exploded in the financial market frenzy before the crisis and by 2007 their real pay had risen by 77 per cent since 2001, compared to the average worker’s real wage rise of 11.2 per cent over the same period. 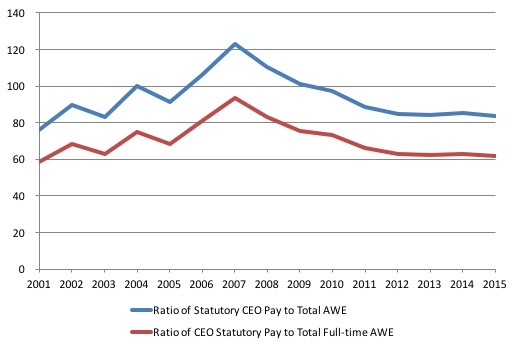 The real pay of CEOs and average workers has fallen in the last year (marginally). In 2008, for example, fixed pay seemed to be set on a sky-high trajectory. Between 2001 and 2008, median fixed pay for Australian CEOs rose a staggering 120%, from $780,975 to $1,745,856. But in the wake of the GFC … we’ve since seen fixed pay come down. To be clear, the shrinking of fixed pay is certainly not due to incumbent CEOs taking pay cuts, though they are receiving minimal pay rises. It’s down to boards taking the opportunity to pay the replacements of departing CEOs less. These issues combined mean that in 2015, median fixed pay for 2015’s ASX100 CEOs was back to pre-2008 levels, at $1,715,087. It’s interesting to note that the same cannot be said for CEO pay in the USA and UK, which continues a seemingly inexorable rise. There was a report this week (see January 14, 2017 New York Times article, for example – How Davos Brings the Global Elite Together) how the elite are planning some simulations at their talk fest in Davos this week. … where Davos attendees crawl on their hands and knees and pretend to flee from advancing armies. Once they escape the feeling of hunger, homelessness, discrimination, fear and torture, the attendees move on to one of “several official cocktail receptions … small, intimate dinners … dazzling affairs … with Jamie Dimon and Tony Blair … ” and more. 1. March 8, 2017 – I will be giving the Annual Joan Muysken lecture at the University of Maastricht in the Netherlands. It will be an evening event and open to the public. I will publish more details later. 2. September 25, 2017 – I have accepted an invitation to speak at the British Labour Party Annual Conference in Brighton. 3. September-October – Pluto Books will be launching our new book in the last week of September and I will visit a number of cities in Britain and Europe in the 10 days following the launch to promote the book and discuss its contents at various public events. I’m sure the Davos refugee simulation was nearly as realistic as the idea that CEOs are paid according to their marginal product. You are right- you really couldn’t make this stuff up. capitalism in its current form has too many inbuilt grievances for it to be a long term proposition from this juncture. as difficult as it seems to imagine, I think socialism and communism , hopefully without the despotism will make a come back , or at the very least a more humane capitalism , with fiat as the dominant currency mechanism. The simple truth is that those that live on the same side of the tracks look after each other. Boards, CEO’s and senior management are all of the same feather as with administrations in large teaching organisations as any academic will tell you. At one time in WA the ratio of administrators to teaching staff in the TAFE system was 12 to 1 with not a single lecturer on tenure, unlike the administrators who had permanent jobs. In the late 80s Vic Rail was under pressure to cut operating expenses – despite 12 levels of management the solution was to remove guards from trains. I’m sure you could fill a book with this sort of stuff.